Nick Faldo is a British golf champion and lead golf analyst for CBS Sports. Faldo is a nine-time PGA Tour winner as well a thrity-time European Tour winner. Faldo was the European Tour Order of Merit winner for 1983 and 1992 plus he was named European Tour Golfer of the Year for 1989, 1990 and 1992. Faldo was also named European Tour Rookie of the Year for 1977 as well as PGA Player of the Year for 1990. Faldo was inducted into the World Golf Hall of Fame in 1997. 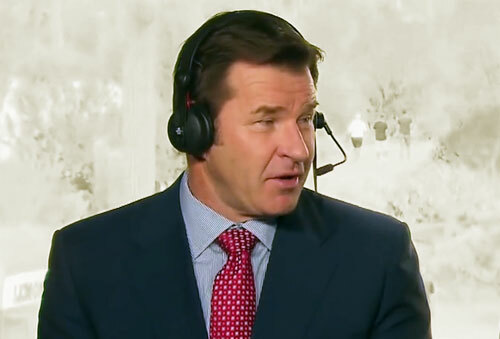 From 2004 to 2006 Faldo became a broadcaster for ABC Sports’ PGA Tour coverage and in 2006 Faldo signed a contract with CBS to be the network’s lead golf analyst. Nick Faldo was made a Knight Bachelor in 2009 for his services to golf. Sports Speakers 360 is a booking agent for pro athletes. If you would like to book Nick Faldo for a speaking engagement, appearance or endorsement, contact a Nick Faldo booking agent for fees at 1.855.303.5450.